October 2 was the 39th anniversary of the Massacre of Tlatelolco. Mariana Botey, artist, critic, and writer, memorialized the 1968 crackdown on the dissenters of Mexican society with a detailed silk screen print called "2 de Octubre de 1968 Responsables" (2004), partly reproduced above. 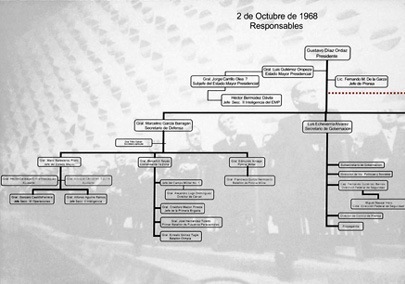 The print consists of a government flow-chart that basically implicates everyone from the military to the president, Gustavo Díaz Ordaz, for the bloodbath that left hundreds dead. Behind the chart are grayed images of some of the men responsible. I saw the piece up-close at the Museo José Luis Cuevas in the Centro Histórico last year, part of an exhibit on art from L.A. and Mexico City, with an emphasis on the Colección Jumex and work done at Self-Help Graphics in East L.A by many of the great names in Chicano art. In its precise condemnation, the Botey print is an arresting piece of artwork. * Thank you Harry Gamboa Jr. for the NSA link above, which details the CIA's surveillance in Mexico City in '68.